Unicorns – These magnificent, mystical creatures have fascinated people for centuries. Today they are more popular than ever. You might have even attended a unicorn birthday party or baby shower. And now you’ll get to host one yourself! 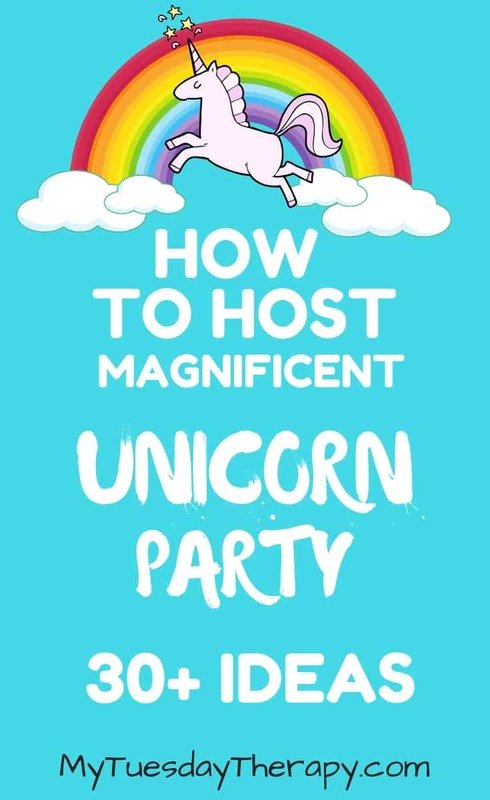 You’ll be inspired by these ideas to throw the most magical unicorn party! Enter the world of unicorns, dreams and wonder. Gallop over the rainbow and relish desserts covered in sprinkles. 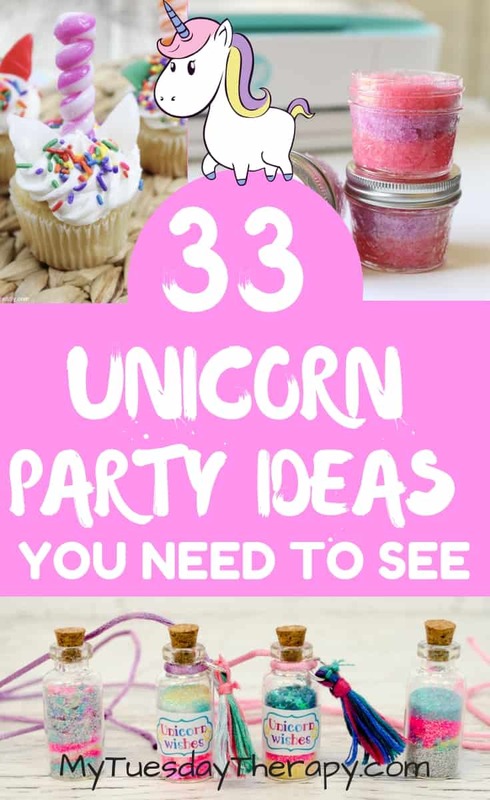 Fabulous, glittering fun ideas for your unicorn party. Get your guests excited about the party with astonishing invitations. Let me present you with three different options that all have a special feeling to them. Magical Day. 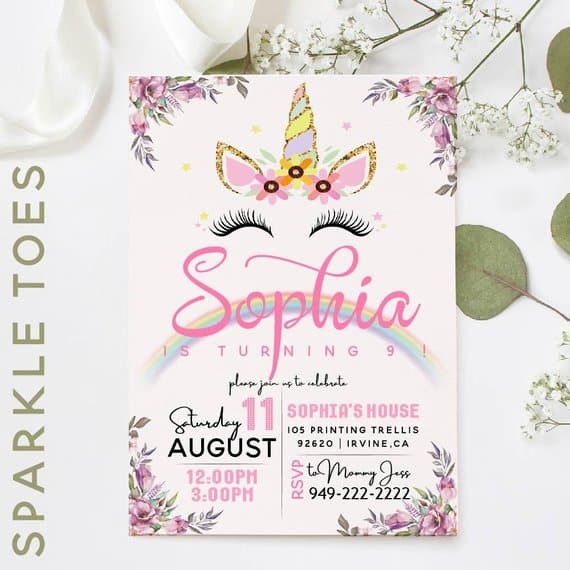 A gorgeous unicorn invitation from RaspberryPartyCo. It is PARTY time! 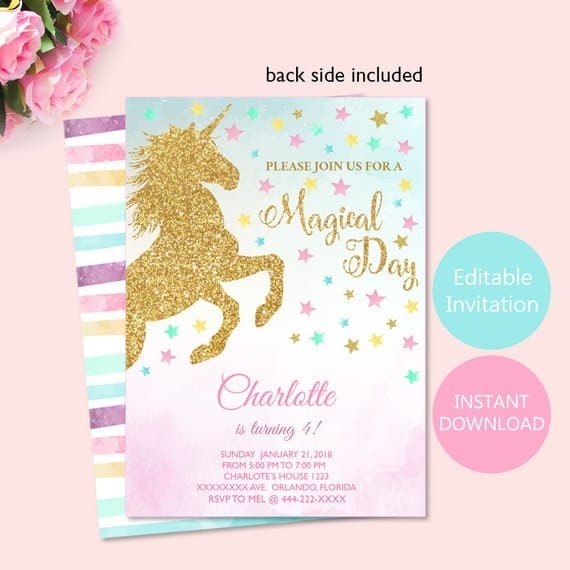 Cool Unicorn Invitation from HappyInvitationStore. 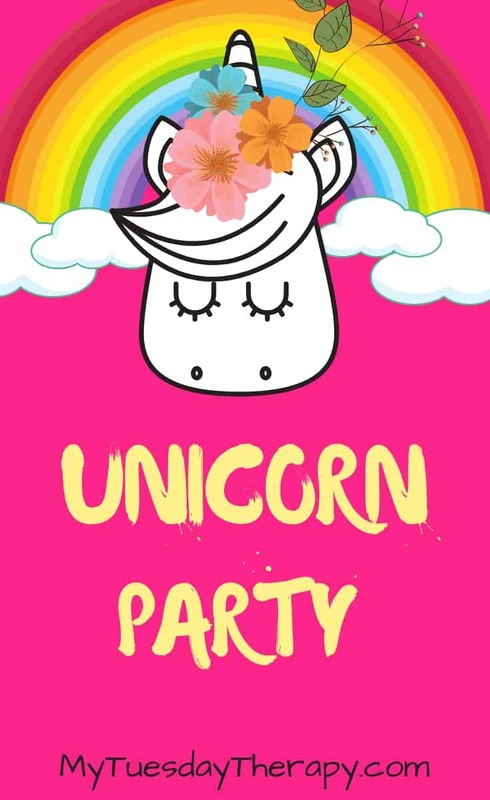 Unicorn parties are all about pretty colors, sparkles, and glitter. Create a magical atmosphere with these fabulous ideas. 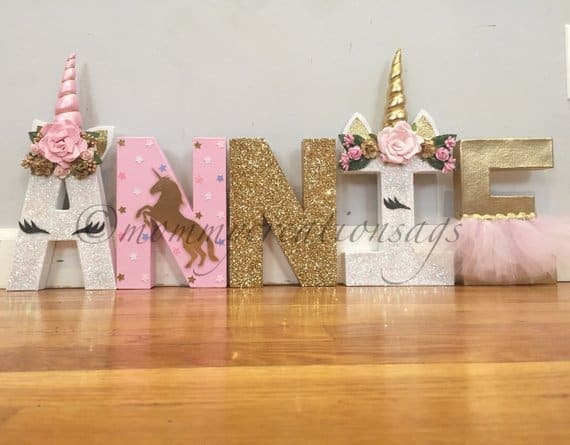 Spell your child’s name with these adorable Unicorn Letters from MommyCreationsAGS. Adds a great touch to your party. And as an added bonus: after the party place it on a shelf in your daughter’s room and use it for years to come. Adorable! I just love these. 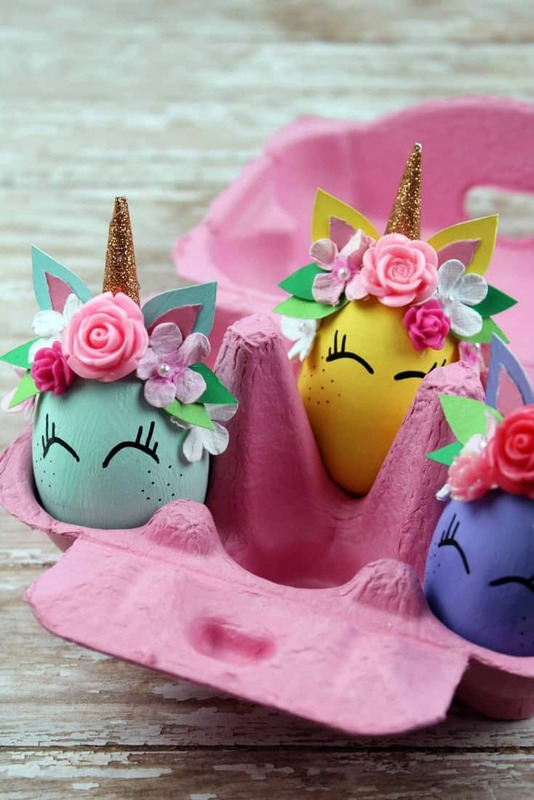 Whimsical Unicorn Eggs from Real and Quirky will bring smiles to your guests faces. Make them before hand to use as decorations or together as a party activity. These eggs would be awesome at Unicorn Baby Shower! “Be a unicorn in the field of horses”. Frame cute unicorn quotes and place them on the tables or walls to entertain the party crowd. 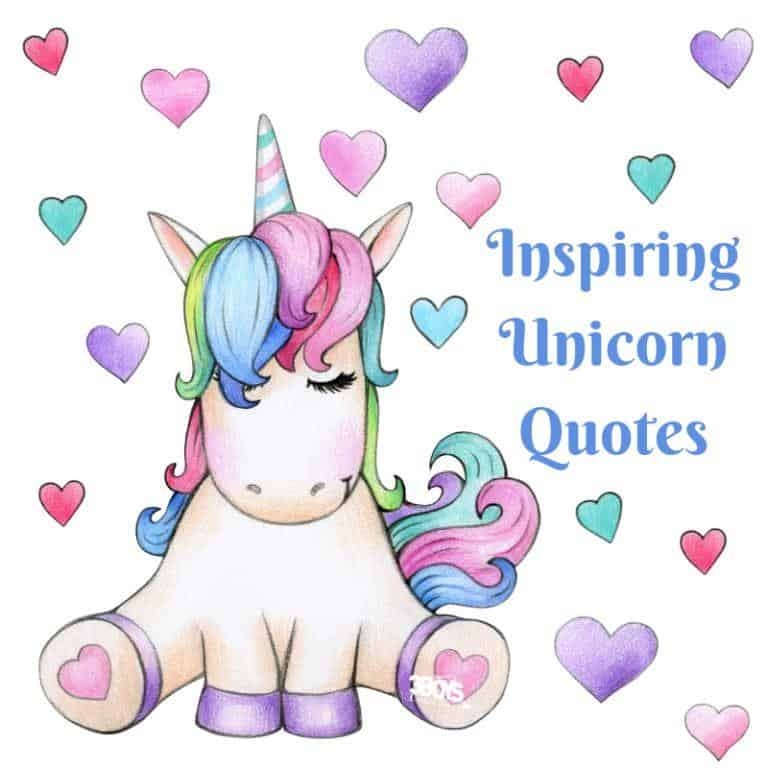 More cool unicorn quotes at 3 Boys and A Dog. Prepare these delightful unicorn slime jars form The Best Ideas For Kids and use them as decorations. And as you might guess I’ll suggest that you give them as party favors. Your guests will love these. Too cute! You could make these jars and fill them up with other goodies too like cotton candy or other colorful treats. 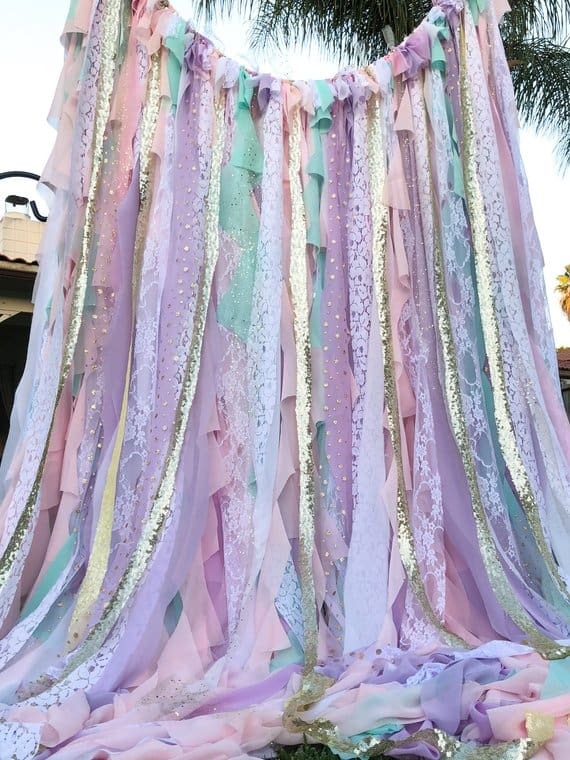 Hang this stunning backdrop from WithLOVEeventdecor behind the cake or gift table or use it as a spectacular backdrop for photos. Your girl will love this one. Soft layers of beautiful fabric create a truly magical feel. 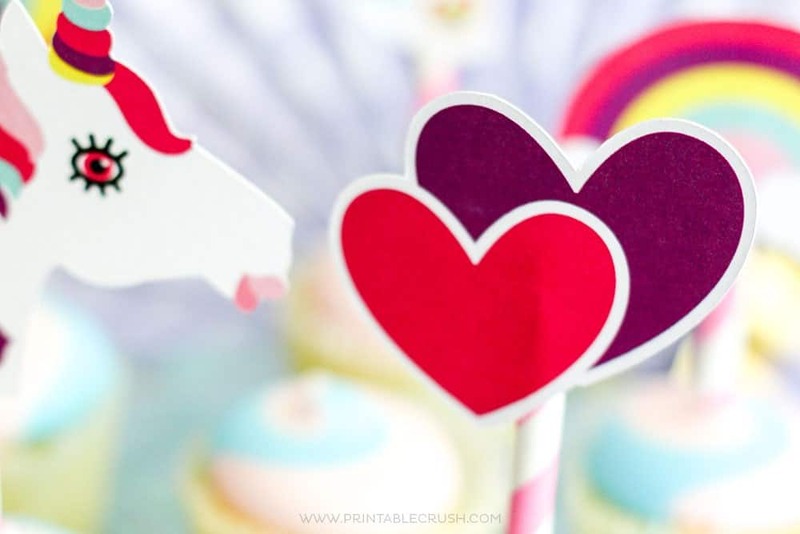 Transform any cupcake into a unicorn cupcake with pretty toppers from Printable Crush. Cupcakes are easy to serve and just the right size of sweetness. 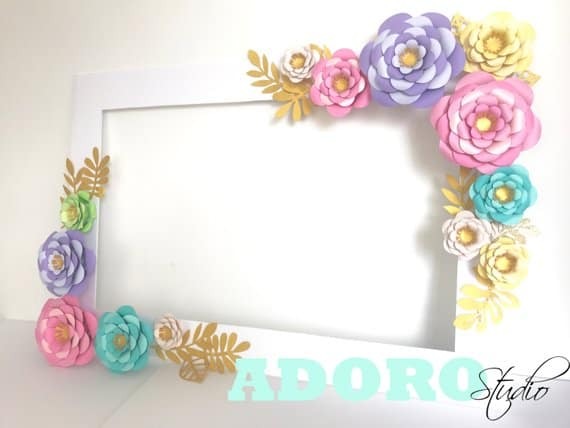 Beautiful frame you can use as a decoration and a photo booth prop. Take adorable photos of the birthday girl and her friends with a Photo Booth Frame from Adoro Studio. Simple things can look really pretty. Balloons in unicorn colors. Clear jars and serving bowls filled with rainbow colored treats. This lovely idea is from Teach Me Mommy. This would be a totally cute focal point for the whole party. 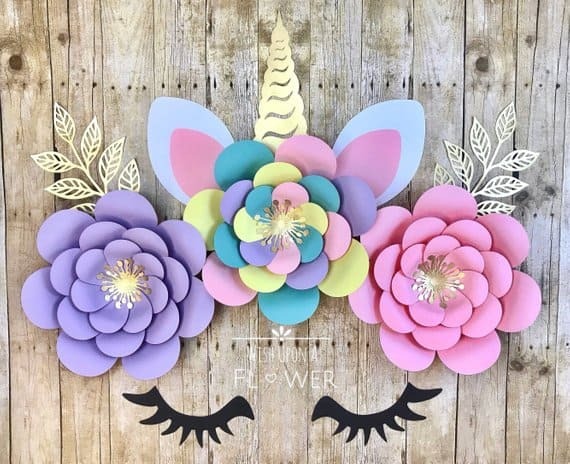 The astonishing unicorn paper flower arrangement from WishUponAFlowerShop is amazing. Use it as a backdrop behind the dessert table and later on in your child’s room. Rainbow arch over a doorway. You can make this with tulle, sheers, or tablecloths. A little bit wire would be helpful to form the shape. Got to have desserts at a birthday party. 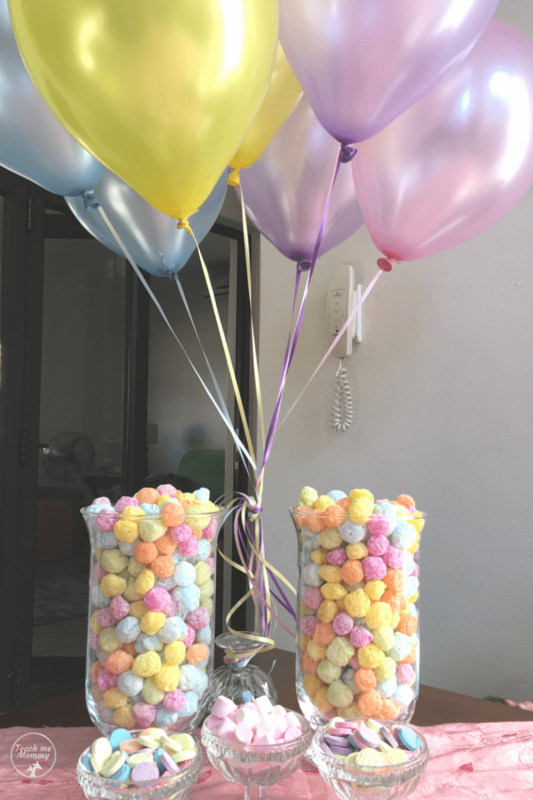 These magnificent creations will charm your birthday girl and her guests. Unicorn desserts are going to be adorable. 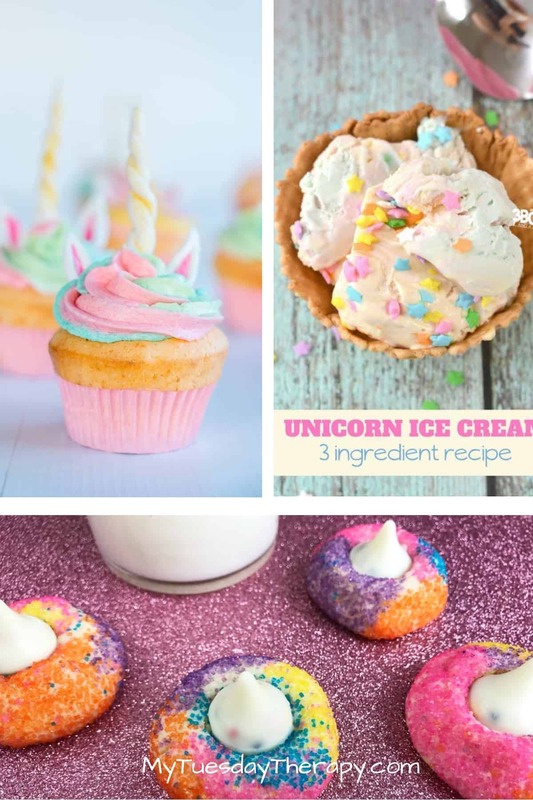 Take a look at these Unicorn Cupcakes by Stacey from My Kids Lick the Bowl. She will even show you how to make the unicorn horn! 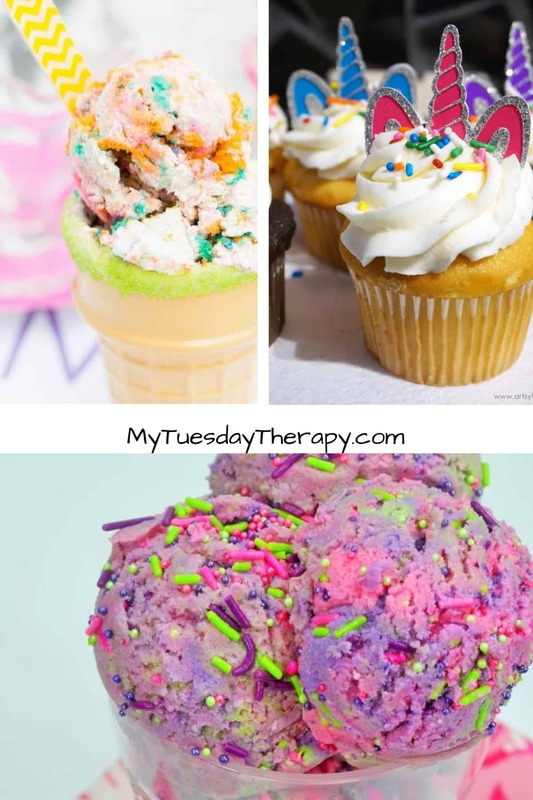 The super easy recipe for Unicorn Ice Cream is from 3 Boys and a Dog. Even if you are not master baker you can make this unicorn dessert. 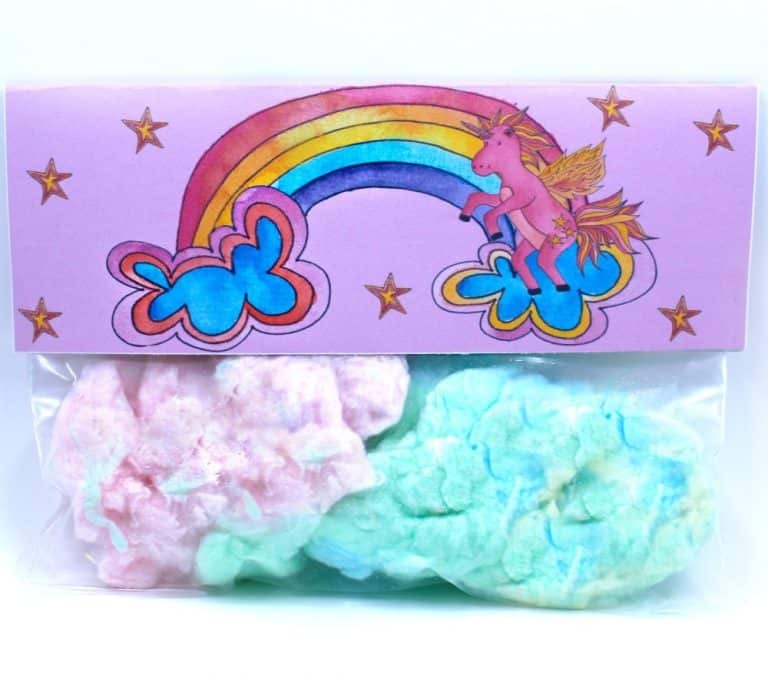 Real and Quirky brings you the easy recipe for delicious sparkly Unicorn Kisses Cookies. Kids will love these rainbow cookies! Another set of wonderful Unicorn Treats. Candy coated pretzel rods are easy to make and so pretty. They are the perfect treat for a birthday party. Angela from The Inspiration Edit will show you how to make these lovely Unicorn Pretzel Rods. 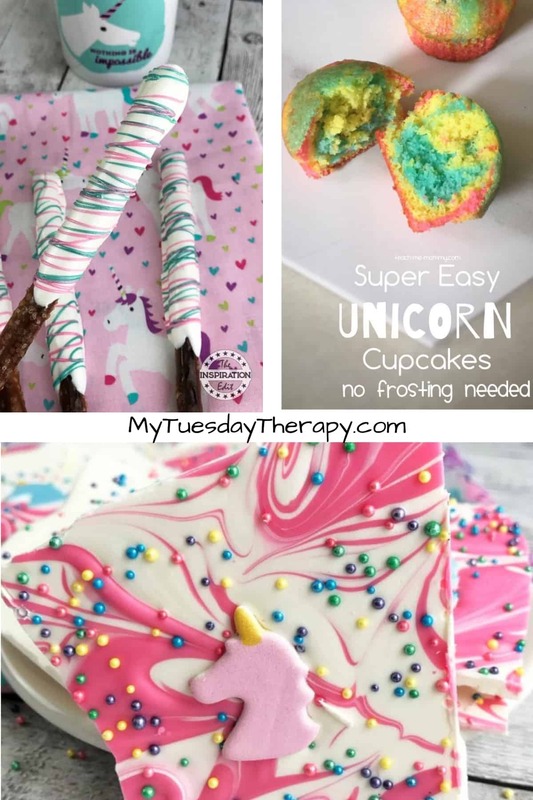 Unicorn Cupcakes from Teach Me Mommy don’t need frosting. They are cute and sweet without it. Nerdy Mamma made this awesome Unicorn Bark Candy. Magical food for your magical unicorn party. Cake or ice cream? You’ll get both in the awesome No-Churn Ice Cream Treat from Spaceships and Laser Beams. Unicorn Cupcakes with a Cute Cupcake Topper from Artsy Fartsy Mama. 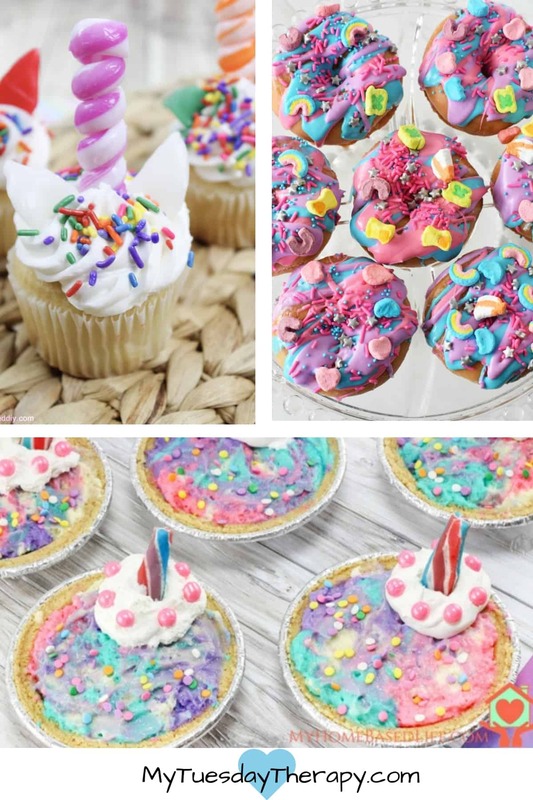 You can use any kind of cupcakes when you have unicorn cupcake toppers. Who wouldn’t want to eat cookie dough. Especially, colorful rainbow Unicorn Cookie Dough. Nerdy Mamma has a fun recipe for you. Unicorn Cupcakes are popular! The delightful Cupcakes with Edible Cupcake Toppers are from Kimspired DIY. Birthday sweets don’t have to be complicated to look awesome. Unicorn Donuts! That’s something fabulous! Savvy Saving Couple will show you how to make these Easy but Stunning Donuts for you unicorn birthday party. I love cheesecake so of course I’d think that Unicorn Mini Cheesecakes from My Home Based Life are a must for a Unicorn Party. 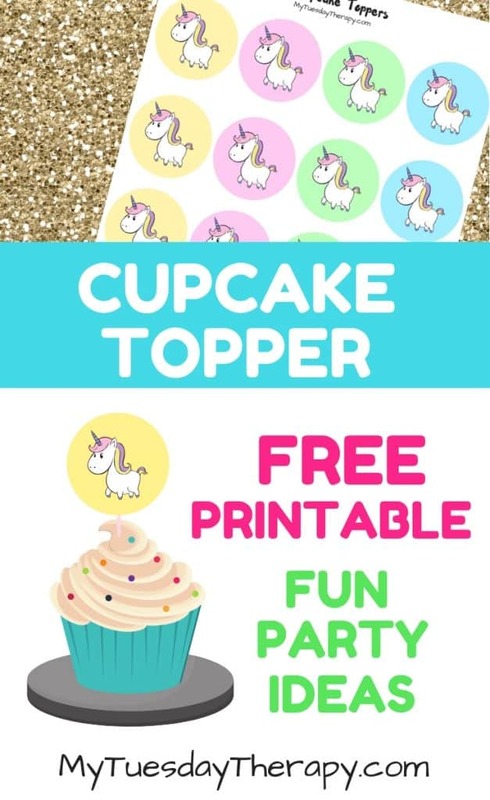 These cute unicorn cupcake toppers turn any cupcake into a unicorn cupcake! You find them in the My Tuesday Therapy Printables. No need to sign up or anything. Just click and print :). They work well also as favor tags or can be printed on a sticker paper and used for decorating invitations or water bottles etc. 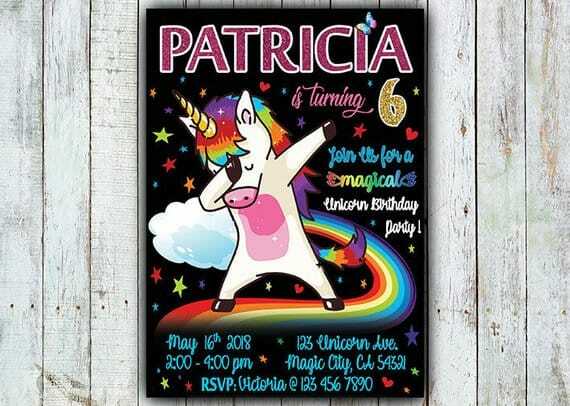 This party needs magical unicorn games and activities. 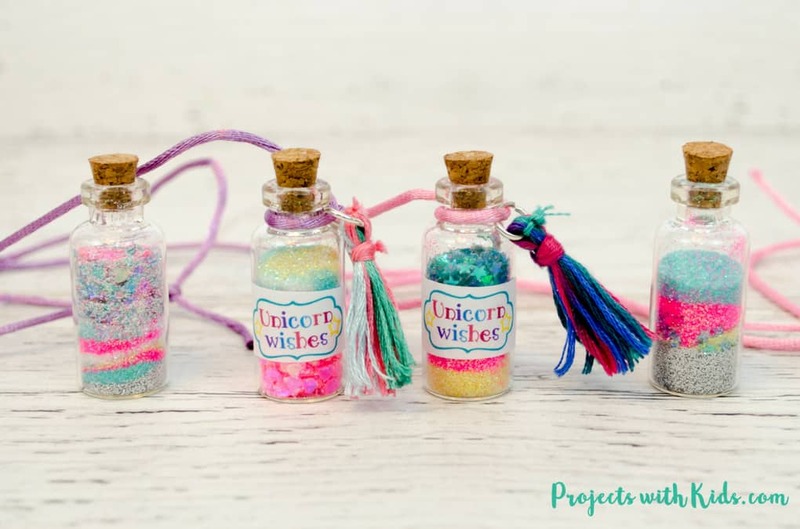 Sparkling fun Unicorn Wishes Bottles from Projects With Kids. These bottles make great decorations for girls bedrooms. 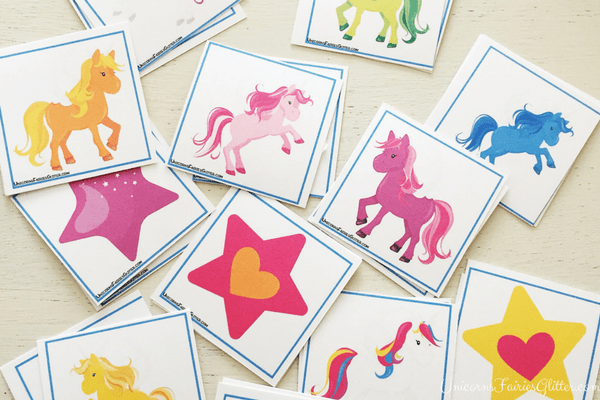 Unicorns, Fairies & Glitter has a fun Memory Game printable that is just perfect for the younger kids. Play a few rounds of this classic game. Have a splendid time looking for the matching pictures. This works well also as a party favor. 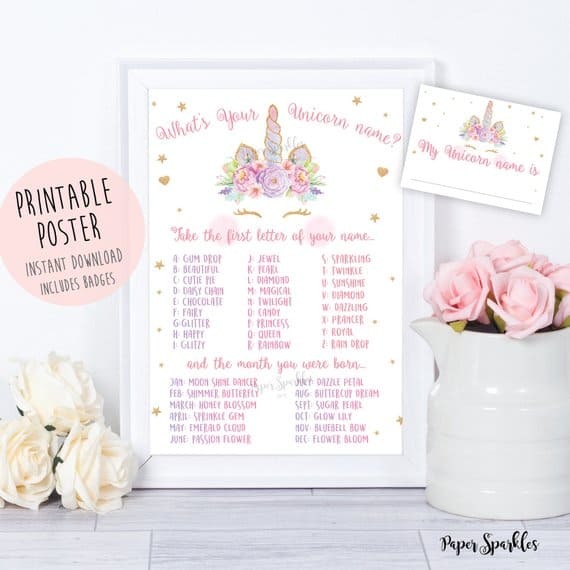 A beautiful printable poster from Paper Sparkles DIY. It comes with cute badges you can wear at the party. Every little girl will be so happy to figure out her unicorn name! Of course, I had to check what my name would be and I am Twinkle Buttercup Dream. What’s your unicorn name? 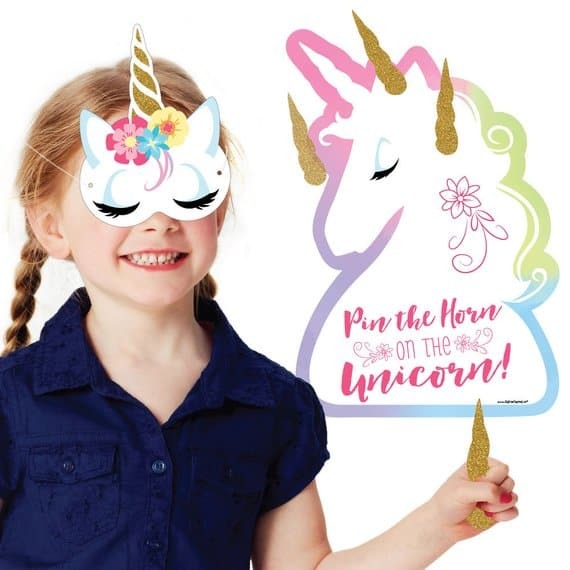 Cover your eyes with a pretty unicorn mask and Pin the Horn On The Unicorn. This game from Big Dot Of Happiness comes with 20 horns and is made of corrugated plastic. Use it more than once! 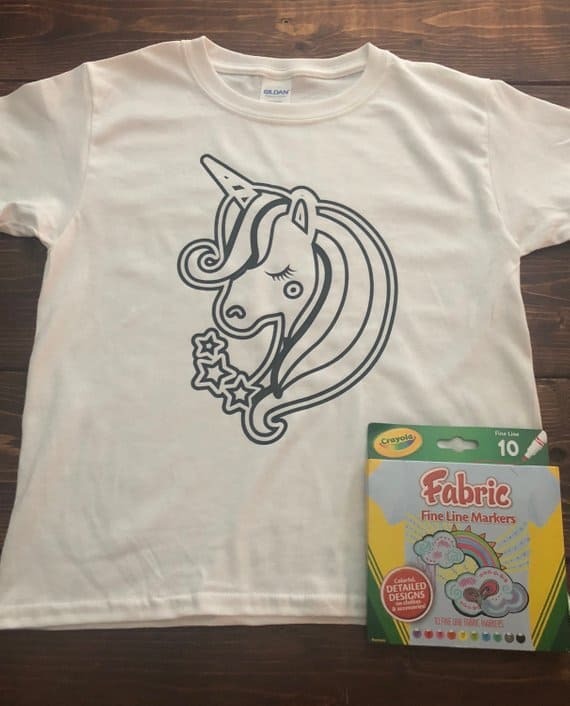 Color your own unicorn t-shirts from The Tigers Trunk. A fun way to keep the girls busy at the party. They can work on art and chat while being creative. All this slime stuff is so popular now. The recipe from See Vanessa Craft is super simple and will be a fun activity to do at your party. 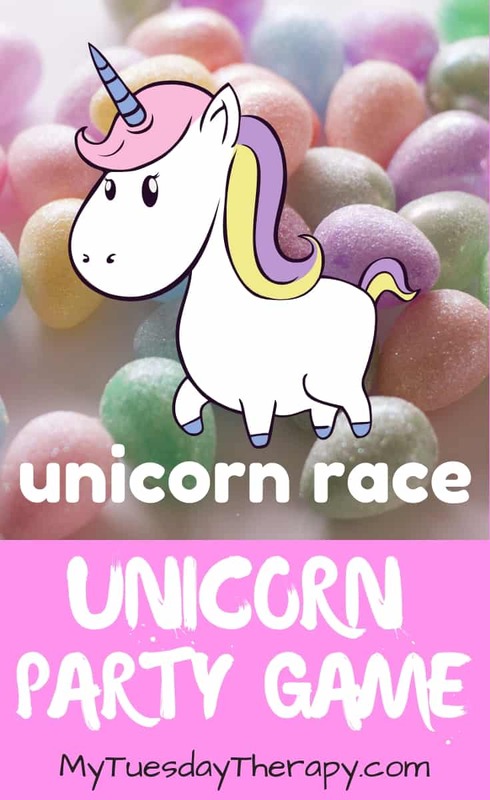 5 cute unicorn coloring pages for the kids to color. You could also have the birthday star to color them. Put them in frames and use as party decorations. You’ll find the coloring pages in My Tuesday Therapy printables. Free for you to use. Loving this! The party guests will have a great time stuffing their own unicorns. Attach to dowels with hot glue and you are ready to gallop over the rainbow. 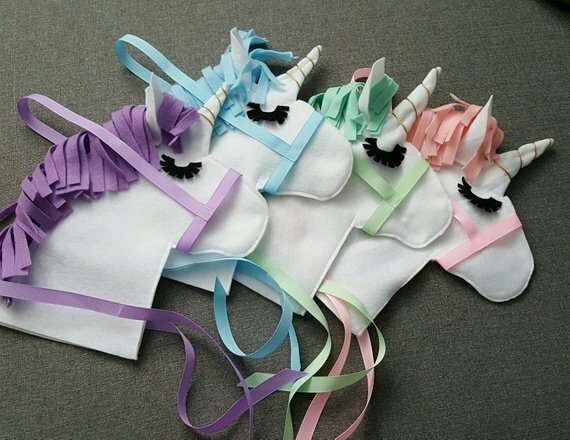 You can get these adorable unicorns from SEWnSoHandmade. Mark a starting point. Place the traffic cones “horns” far away from the starting point. The kids put a half of an egg on top of their heads. Run around the horn and come back to the starting point. They add another egg half on top of the other and go around the horn again. Continue until they have gone around the horn with all the eggs. The one who finishes first is the winner. 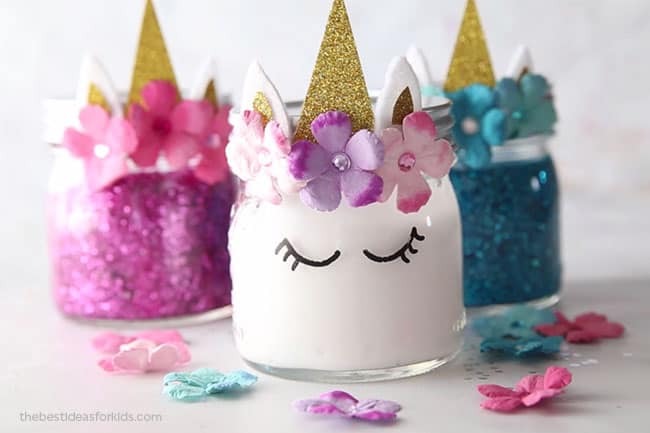 RELATED POST: 25 EASY UNICORN CRAFTS – PERFECT FOR PARTIES! Send your guests home with magical memories and unicorn party favors! 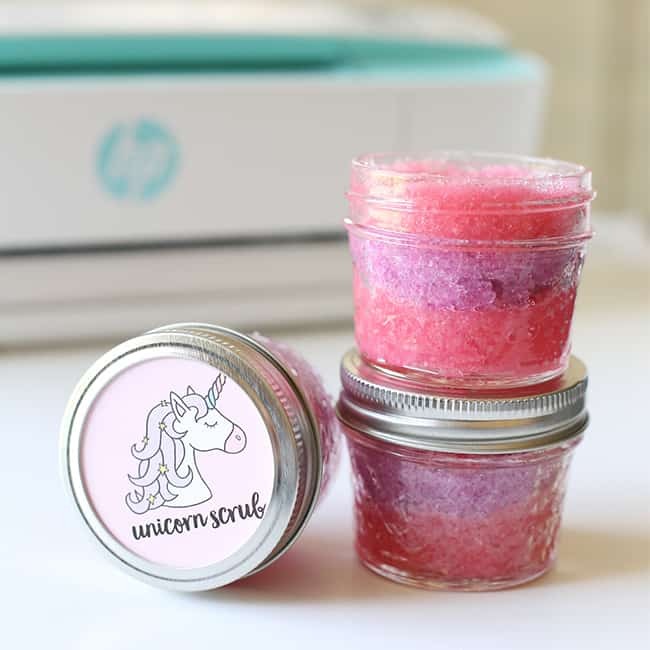 Sweet smelling, attractive Unicorn Sugar Scrub from My Printly. Easy to make, fun to give and so amazing to use. 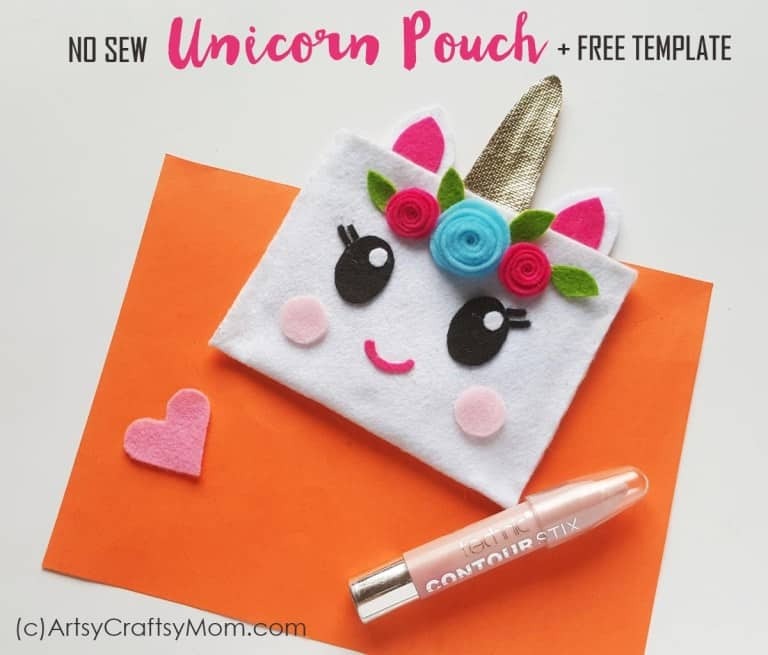 No Sew Unicorn Pouch. You could make these and use them as favor bags… and instead of a contour stick put a chapstick or candy inside :). Another fun way to use this pouch from Artsy Craftsy Mom is to give the pouch supplies along with instructions as a party favor. An adorable set of key rings. The girls will be excited to have these hanging from their backpacks! An easy and cheap unicorn party favor: hair ties. The guests will love these! 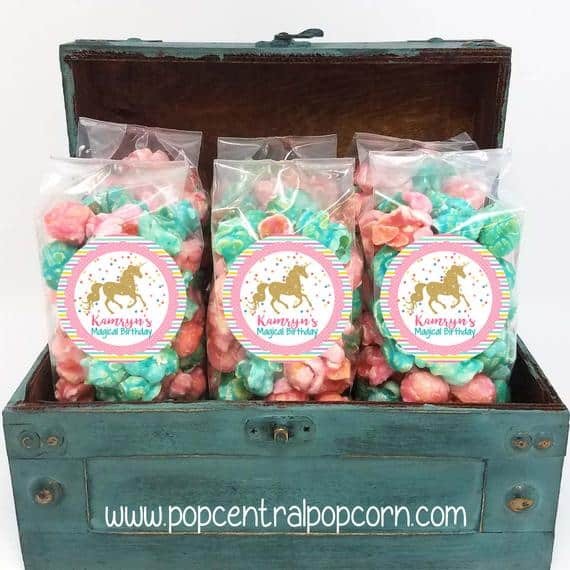 You have five flavors such as Confetti and Cotton Candy Mix to choose from. Each bag of popcorn from PopCentralPopcorn is sealed for freshness and come with a personalized sticker.